Bring a large pot of salted water to a rolling boil and add the pasta. Cook according to package directions. Meanwhile, slice the cherry tomatoes in half, finely chop the fresh basil, and mince the garlic. 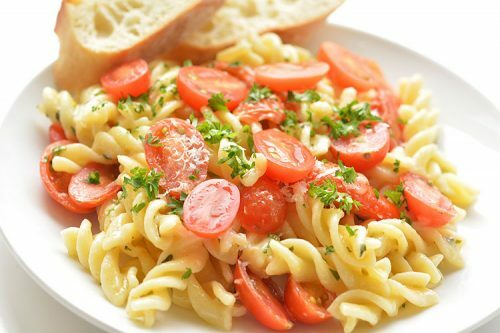 Combine the cherry tomatoes, garlic, olive oil, basil and salt and pepper in a small bowl and let it marinate while the pasta cooks. When the pasta is cooked, drain the water and return the pasta to the pot. Immediately add the tomato mixture and the grated mozarella cheese and stir to combine. Cover the pot and let it sit for 5 minutes. Stir again and serve immediately with freshly grated parmesan cheese and fresh baguette.